OBJECTIVES: The purpose of this case report is to describe a patient with suspected suprascapular nerve entrapment with its findings and associated deficits, in addition to treatment strategies which also included iontophoresis with Iontopatch. CASE DESCRIPTION: The patient is a 72-year-old right hand dominant male who presented with insidious “ache-throbbing-burning pain” in the posterior superior right scapular area with intermittent “throbbing pain” in the right medial scapula and when symptoms worsen the pain radiates into the right posterior shoulder and right posterior upper arm. In addition he noted a “weakness-jerking-slipping sensation” when he reached forward when holding a small object such as drinking a cup of coffee. 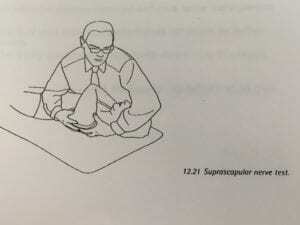 METHODS: The first visit included a conventional initial evaluation in which concluded suspecting primary suprascapular nerve entrapment with its explanation to the patient. Treatment was initiated utilizing iontophoresis via Iontopatch, in addition to patient education encouraging tissue protection principles, gentle neural mobilization and the postural approach progressing into proper neuromuscular reeducation of the scapula and rotator cuff. RESULTS: At the third treatment session 1 week later, he reported a 50% improvement at light activity level. At the fifth treatment session, reported maintaining an 80% improvement in pain and function at light to moderate activity level. Unfortunately thereafter a re-exacerbation however at the eighth treatment session reported maintaining approximately a 95% improvement since initial appointment approximately one month following the initial treatment session. 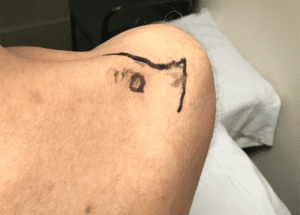 DISCUSSION: The combination of utilizing iontophoresis with dexamethasone via Iontopatch in an attempt to positively impact the lesion of the suprascapular nerve at the suprascapular notch, gentle neural mobilization and reeducation of the shoulder–scapular musculature may have all contributed to this patient’s successful outcome. Entrapment neuropathies are a group of disorders of the peripheral nerves that are characterized by pain and/or loss of function (motor and/or sensory) of the nerves due to chronic compression, tension and sometimes systemic disorders. Examples of causes for nerve entrapments include soft and bone tissue masses such as lipomas, cysts, repetitive motions, predisposing anatomical makeup, posture and body mechanics, trauma or injury, pregnancy, or systemic disorders such as rheumatoid arthritis. Entrapment neuropathies result in impaired blood supply to the nerve and manifest symptoms including pain, paresthesia, burning sensation, tingling sensation, numbness, muscle weakness, muscle wasting, and impaired movement of affected muscle.7 The purpose of this case report is to review a suspected case of suprascapular nerve entrapment; a diagnosis that is often missed and discuss the manifestation, presentation, and treatment strategies for this case. The patient is a 72-year-old right hand dominant white male with referral from his PCP for right shoulder pain. He is retired, and reports being active at home and in the community. He states that he must sleep on his right side due to his wife’s CPAP machine “blowing in my face” if he attempted to sleep on his left side. The patient reports he is generally healthy with a recent diagnosis of an inguinal hernia which he was planning to have surgically repaired within the next few months. He states he has smoked tobacco for greater than 10 years and that he occasionally drinks alcoholic beverages. When asked about his physical activity level he reports it is limited to his hobbies, taking care of his home, and tending to his property. His hobbies include yard work and filming family functions. He enjoys hunting and frequently shoots rifles with the stock against his involved shoulder; in addition he frequently reloads his own bullets-shells levering down hard with his right upper extremity. His past medical history includes bilateral knee replacements in 2012, mixed hyperlipidemia in 2017, plantar fascia syndrome in 2017, benign prostatic hyperplasia with lower urinary tract symptoms in 2017, and current abdominal wall hernia. He reports no significant family medical history. Current medications include Meloxicam, Simvastatin and Vitamin D. No imaging or electro-diagnostic studies. Fairly constant “dull discomfort-ache” with intermittent “throbbing and burning pain” in the posterior superior right scapular area with intermittent “throbbing pain” in the right medial scapula and when symptoms worsen the pain radiates into the right posterior shoulder and right posterior upper arm. He reports his pain ranges from a 2/10 at best and a 6/10 at worst on the Visual Analogue Scale. Denies paresthesia in the right upper extremity. Intermittent “weakness-slipping sensation” when he is reaching forward when holding a small object such as drinking a cup of coffee. States recently this occurred regularly when video filming with a camcorder. Patient demonstrated as he flexes his right shoulder to approximately 90° with horizontal adduction of the shoulder and protraction of the scapula, reports his arm would involuntarily “move–jump–give way-slips away” several inches laterally into horizontal abduction in which it “feels like it briefly catches” with apparent brief crepitus in the right shoulder. States insidious gradual onset approximately 1 year ago with “very minor soreness” located in the right posterior superior scapular region in which he began to notice his right hand–arm would “quickly jumped out about an inch” when drinking his mug of coffee. Reports significant insidious gradual worsening of his pain, weakness and function in the last 3-4 months. He denies any prior history of right upper extremity pain or trauma. Denies prior throwing–racquet sports when he was younger. Utilizing the Upper Extremity Functional Index (UEFI) this patient initially rated a score of 64/80. He noted he had significant difficulty lifting a bag of groceries overhead and opening a jar. He had moderate difficulty performing usual housework, hobbies, recreational activities, and throwing a ball. He had slight difficulty with pushing up on his hands from a chair, vacuuming and raking, using tools and appliances, and cleaning. The patient demonstrated an increased thoracic kyphosis and rounded shoulders, with minimal to moderate visible and palpable muscle atrophy noted in the supraspinous fossa and infraspinous fossa of the right scapula compared to the uninvolved left. Active cervical and shoulder girdle range of motion (ROM) are symmetrical and unremarkable with the exception of visible minimal to moderate right scapula dyskinesia more so with flexion than abduction. Active and passive shoulder elevation and external rotation is unremarkable, however passive internal rotation with hand behind his back minimally provoked pain near spine of the scapula of right shoulder. Supine passive shoulder internal and external ROM was symmetrical and unremarkable. Manual muscle tests (MMT) of the involved shoulder were all pain-free with internal rotation 5/5, adduction 5-/5, abduction 4+/5, and external rotation 4/5 compared to the uninvolved. The audible popping- clicking-crepitus was noted during resisted abduction and external rotation. Other MMT to the elbow, wrist and digits were symmetrical and unremarkable. Gross sensory differentiation of the upper extremities was symmetrical and unremarkable, including over the acromioclavicular joint area. 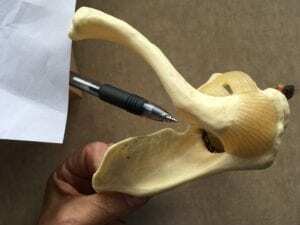 Acromioclavicular and sternoclavicular joints were unremarkable to palpation. 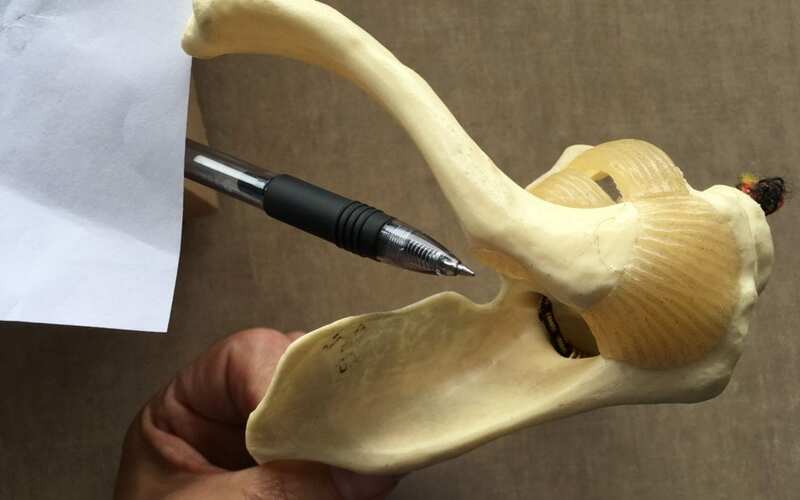 Glenohumeral joint specific testing was symmetrical and unremarkable. Negative Neer test and Hawkins-Kennedy test. Passive horizontal adduction test with contralateral cervical side bending was negative. Supine suprascapular nerve bias-stretch test per Butler 13(p.339) reproduced his “sharp burning pain” in the spine of the scapula area, however in this case patient reported no change with cervical side bending. Side bend their head contralaterally towards you. Control the shoulder girdle with your hands and move their shoulder girdle away from their neck by gently pushing your chest down on the shaft of their humerus. With both hands on their scapula, depress their shoulder girdle. Then rotate their scapula with your hands. Medial rotation of the scapula may be more sensitive than lateral rotation. Suspect possible suprascapular nerve entrapment: “burning” pain of the shoulder, minimal visible and palpable atrophy of the supraspinatus and infraspinatus, painfree weakness with resisted abduction and external rotation, a positive suprascapular nerve-bias stretch test per Butler 13(p.339), and potential hyperalgesia in the suprascapular fossa near the area of the suprascapular notch. Fairly constant dull pain with intermittent throbbing/burning pain: burning/throbbing pain indicative of nerve ischemia supported by forward shoulder posture, increased thoracic kyphosis, and reports of sleeping on the involved side with the involved shoulder horizontal adducted and protracted underneath body weight, resulting in potential traction – compression of the suprascapula nerve. Intermittent throbbing pain near medial border of right scapula: potential referred pain from suprascapular nerve and affected musculature. 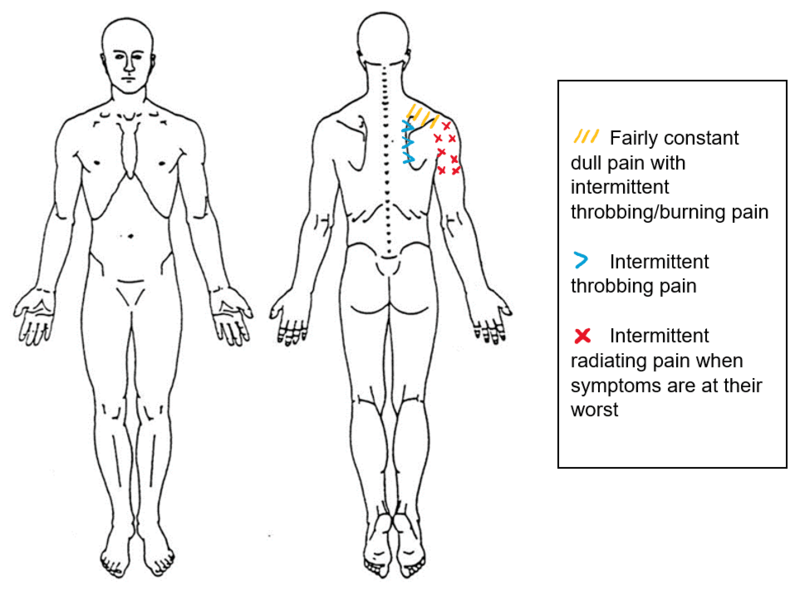 Intermittent radiating arm pain: neural tissue potentially referring pain distal to the site of irritation. Postural education: Education and correction of excessive thoracic kyphosis in seated and standing positions, encouraging slight scapular retraction, elevation of sternum, and slight cervical retraction. These modifications aimed to create more space and relieve tension for the suprascapular nerve along its course from the brachial plexus to the supraspinatus and infraspinatus. Activity modification: Avoiding positions which put tension on the suprascapular nerve; horizontal adduction of the shoulder and protraction of the scapula. Modified sleep position by encouraging left side-lying with pillow support under right upper extremity which provided patient with relief and improved ability to sleep which supports tissue healing. Gentle nerve mobilization with ipsilateral cervical sidebending: Began with gentle movement through the lower and upper arm, progressing to scapular elevation, protraction, and retraction. Progressed to supine passive horizontal adduction of the involved upper extremity by guiding involved extremity with uninvolved extremity. Proper shoulder activation and control: Benefited from standing with scapulae against the wall while performing gentle isometric external rotation, internal rotation, forward flexion, and extension of the shoulder, and then eventually elbow flexion and extension and beginning early activation into elevation to regain rotator cuff and scapula control. Initiated treatment one week after exam which included initiating Iontopatch with dexamethasone over the irritable the suprascapular notch area (Figures 3 and 4) for the first 2 appointments that week. The next week at the 3rd treatment session he reported maintaining ~ 50% improvement at light activity level; continued treatment including continued Iontopatch. The next appointment 2 days later reported maintaining a 50-60% improvement with no further “burning pain” and no further “jerking” the last few days when drinking his coffee; continued with Iontopatch . 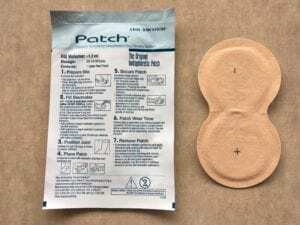 Five days later at the 5th treatment session, “reported “doing good” and reporting an 80% improvement at light to moderate activity level since initial treatment session 2 weeks prior and thus discontinued the Iontopatch for treatment session that day. Unfortunately 2 days later he presented with increased “dull ache again” 3-4/10 with “no burning pain” and reported his 80% improvement level had decreased to approximately the 40% improvement level since the initial treatment session. States he had lost some control of his arm and was compensating drinking his coffee with more of an initial adduction moment of his arm than he did just several days ago. However patient stated 2 days prior later in the day, he lifted two 50 pound bags of corn to waist level, and also leaf-blowing with his right arm. However neither of these activities provoked his symptoms at that time until the next day. Thus we regressed from treatment progression and returned to Iontopatch, and 5 days later he reported he had recovered to the prior 80% improvement level with ache more intermittent and less “jerkiness” again. W thus were able to gently progress his program again including continued Iontopatch the next 2 sessions that week. When patient was last saw approximately one week later at treatment session #8, he reported no further pain and no further “jerking” when drinking his coffee. He reported maintaining approximately a 95% improvement overall in pain and function since initial appointment at light to moderate activity level. Stated he was still experiencing some pain when lying on his right side, however stated he had switched to the left side of the bed to avoid his wife’s CPAP machine and was now able to lay on his left shoulder without pain in order to avoid aggravating his right side. Followed up with patient on phone approximately 2 weeks later and he reported he was very pleased with his right shoulder outcome and was still reporting at least a 95% improvement in pain and function since initial appointment at light to moderate activity level. Stated he no longer slept on that shoulder and that he could easily bring a cup of coffee to his mouth without the unexpected–involuntary “jerking” away from his mouth. Reported the “grinding–creaking” of the shoulder in these positions had also moderately improved. He ultimately requested discontinuing therapy and felt as though he could continue to manage his condition independently. The patient was willing to complete a full Upper Extremity Functional Index (UEFI) over the phone and scores resulted in a 77/80, a 13-point improvement which is clinically significant.11 Areas of difficulty on the UEFI included moderate difficulty opening a tight jar, and minimal difficulty carrying a suitcase with his affected limb. Objective measures of strength, tenderness to palpation, and nerve-bias tension test per Butler were unable to be retaken secondary to patient request to discontinue therapy over the phone. Unfortunately, no radiographic imaging was performed which did not allow for identification of suprascapular notch type, superior transverse scapular ligament type, or presence of anterior coracoscapular ligament. Due to the patient’s gender, it is plausible that he might have the predisposing factor of a narrow suprascapular notch. Although nerve conduction velocity testing was unavailable, a positive suprascapular nerve-bias stretch test was able to rule in the possibility of suprascapular nerve entrapment. For this patient, conservative management appeared to be very effective for decreasing symptoms and increasing function. The patient reported that education about his pathology and activity modification was most helpful for his recovery. Although not mentioned in the current literature, iontophoresis appeared to be very effective at reducing pain and inflammation in the early treatment sessions for this individual despite this nerve not being a traditionally treated superficial tissue. Iontopatch (Travanti Medical) claims their patented technology for delivering iontophoretic medication utilizing electrode coatings with very low voltage of (1 volt) over an extended 12-14 hour period of time permits a significant decrease in tissue warmth, resulting in deeper and more local penetration of the medication molecules, and significant less absorption of the medication into the bloodstream. Recommendations for identifying suprascapular nerve entrapment include awareness that subjective reports of burning can indicate neural involvement. Careful attention should be paid to subjective reports of provocative shoulder protraction and horizontal adduction in the absence of acromioclavicular pain, as these positions can increase tension of the suprascapular nerve. Recommendations for future research include investigating the effectiveness of iontophoresis for symptomatic pain relief at the suprascapular notch, effectiveness of conservative management of specific therapeutic exercises of the shoulder girdle, and utilization of nerve-bias stretch tests for patients with suprascapular nerve entrapment pathologies. Financial disclaimer: Neither author has any financial interest whatsoever in Iontopatch or Travanti Medical. Jacob, P. J., Arun, K., & Binoj, R. (2012). Suprascapular Nerve Entrapment Syndrome. Kerala Journal Of Orthopaedics, 25(1), 21-24. Nerve entrapment. (n.d.) In Physiopedia. Pawar, R. M., & Pawar, M. N. (2015). Complete Absence of Suprascapular Notch: A Case Report. Journal Of Krishna Institute Of Medical Sciences (JKIMSU), 4(4), 150-153. Stratford et al. (2001). Development and initial validation of the upper extremity functional index. Phisiotherapy Canada, 53(4): 259-67. Suprascapular Nerve Block. (n.d.) In Physiopedia. Butler DS. The sensitive nervous system. Adelaide, Australia:Noigroup Publications; 2000.